Tea Leaf Co is a Toronto-based tea retailer. All their teas are certified organic by Ecocert Canada and the USDA. 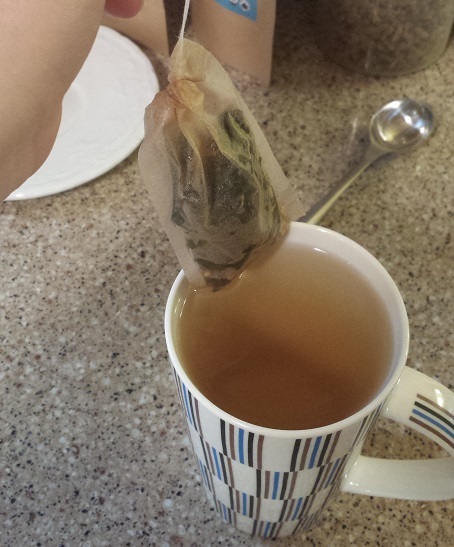 Most (but not all) of their teas come in sample-sized pouches of 20g. Shipping is free for orders $49, but as a bonus, shipping is a flat rate of $3 if you buy only sample sizes. I purchased three samples for review and they arrived in my mailbox in Toronto in less than a week. 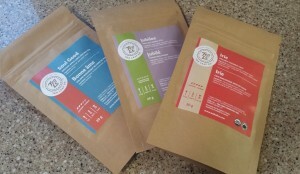 You can buy from Tea Leaf Co online at www.tealeafco.com. 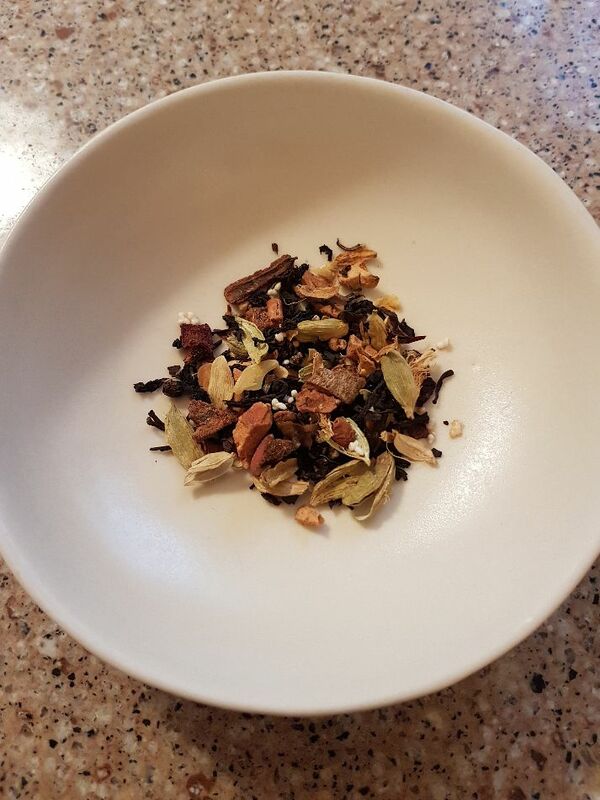 The first thing that will strike you about this blend is the smooth aroma of coconut which permeates the infusion, and flutters amongst the other Chai spices, without overwhelming, imparting that delicious smooth coconut flavor. The sweet notes of citrus come out at the mid point of the flavor development while the cardamom sweetness lingers towards the end… a masterful performance. 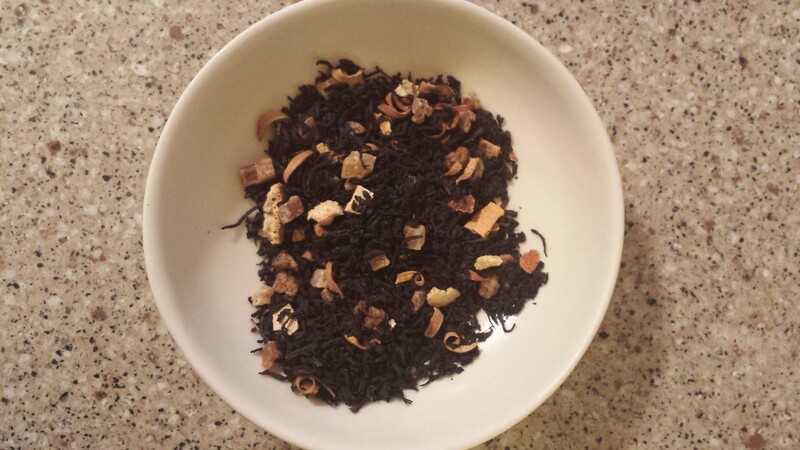 Ingredients: Black tea, cinnamon, ginger, cardamom, cloves, orange peel, black pepper, coconut shreds, natural essences. 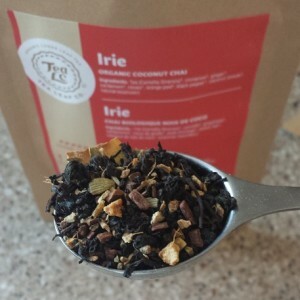 When I first opened the package of Irie tea, I immediately smelled the spices and the orange peel, but I didn’t smell much coconut at first. However, I could definitely see big flakes of coconut in the dry leaf, along with flecks of ginger, cinnamon, cardamom, and orange peel. The leaf was just lovely to look at. 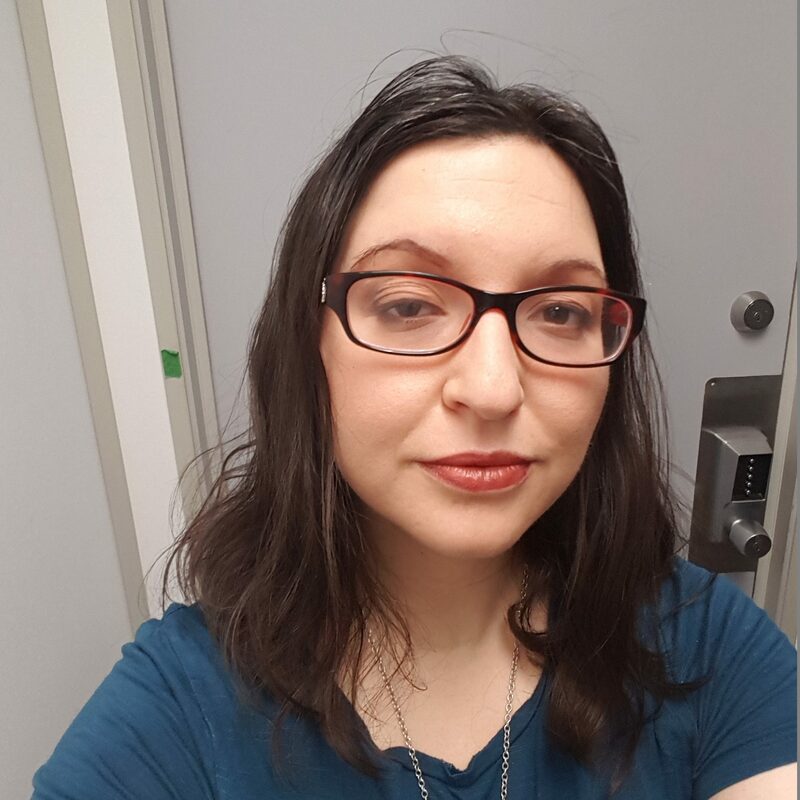 Eventually, I did notice the smell of coconut, but it was light and faint at the back of my nose near my soft palate. I brewed 3 tsp in my 3-cup teapot with 100°C water for 3-4 minutes and added a dollop of agave nectar. 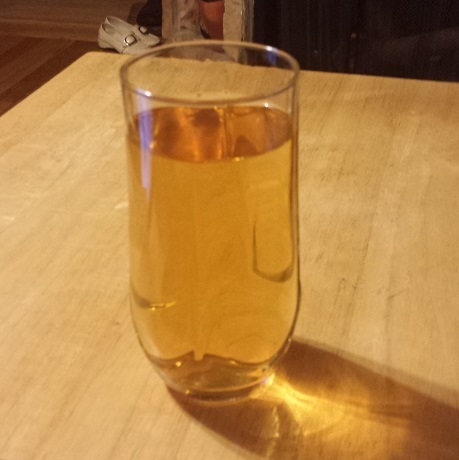 The resulting brew was a clear amber that was lighter than I expected. The smell was a very fine balance of coconut, orange, and spices. The first taste on the tip of my tongue was of sharp spices, which eventually faded to smoothness. After that, the strongest two spice flavours were ginger and cardamom, with coconut becoming a light flavour on the back of my tongue. This was a really smooth chai with a good balance of flavours. However, I do wish that the base tea had been stronger, as it was really light. A perfect cup of all natural apple cider to warm you up this autumn and winter. 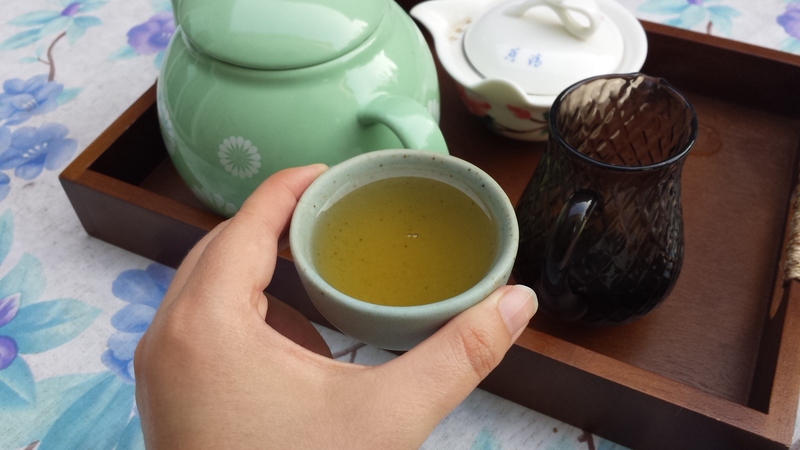 Ingredients: Oolong tea, apple pieces, ginger, natural essences. 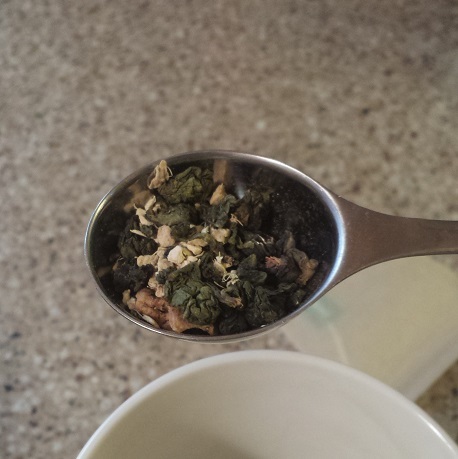 When I first opened the package of Soul Good tea, I smelled a powdery smell that I couldn’t quite place. It reminded me of potpourri or baby powder but not in a bad way — it was soft and sweet rather than dry or chalky. I could smell the ginger and the apple on top of the powder, creating an interesting flavour profile — not quite reminiscent of apple cider, but definitely fruity and spicy. The dry leaf consists of white flecks of dried ginger, brown pieces of dried apple, and dark, curled nuggets of oolong tea. I don’t know enough about oolong to be able to identify what’s being used here, but based on the floral smell and the dark green colour of the nuggets, I’m guessing that it’s either unroasted or only lightly roasted. I brewed the 1.5-2 teaspoons of dry leaf in 1 1/2 cups of water at 85°C for 3-4 minutes. The resulting brew was a pale orange yellow, and the dry leaf had clearly expanded a lot in the filter bag. The brewed smell was quite similar to the dried smell: sweet, soft, fruity, powdery. I added a spoonful of agave nectar (too much, I realized in retrospect) to the cup, which helped bring the flavour forward. The apple was gentle and appeared mostly on the back of my tongue. The ginger was there if I squinted, but it wasn’t that strong. Although this tea is billed as an apple cider oolong, I wasn’t really getting the depth of flavour that I would expect from a cider. I think this is because of the blend’s use of green oolong. I bet it would pack a greater punch if a more heavily-roasted oolong were used for the base. 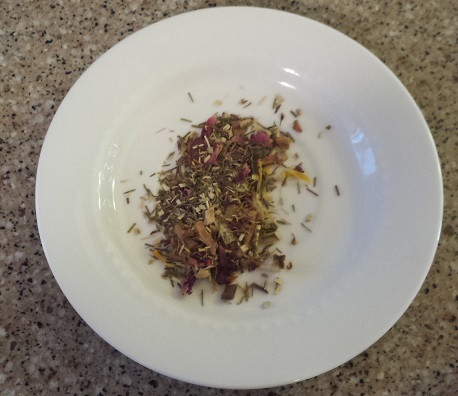 Ingredients: Green rooibos, rose petals, mango pieces, calendula, orange peel, apple pieces, natural essences. The dry leaf for Jubilee was a mix of rose petals, calendula petals, green rooibos, and mango pieces. The smell was like ripe, juicy mango edging into overripeness. In the back, contributing to that overripe smell was the rose, adding a bit of tartness, and the calendula, adding a bit of floral peachiness. 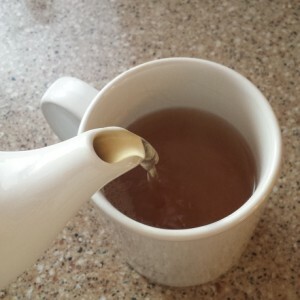 I brewed 8 tsp of the dry leaf in my iced tea pitcher — I boiled one litre of water, added a squeeze of agave nectar, and let it sit for 5 minutes before topping the pitcher up with another litre of cool water and chucking the entire pitcher into the fridge to cool. I let it sit for about 8 hours before pouring out a glass to taste. The liquor was a bright sunny orange, and the dominant flavours were of mango and rose. Again, the flavour itself was very light on the tongue. Almost too light, actually — I worry I may have understeeped this. My favourite tea of this set was Irie because it had a very finely balanced blend of spices. I have some masala chais in my cupboard that taste like a cinnamon stick and others that are pretty much nothing but ginger, and this one sits right in the middle. Plus, the hint of coconut and orange provides depth. The Jubilee iced tea was good, but I think I wimped out on the leaf and didn’t add enough sugar. I think I’ll use the rest of the sample for a single pitcher and see how that fares. 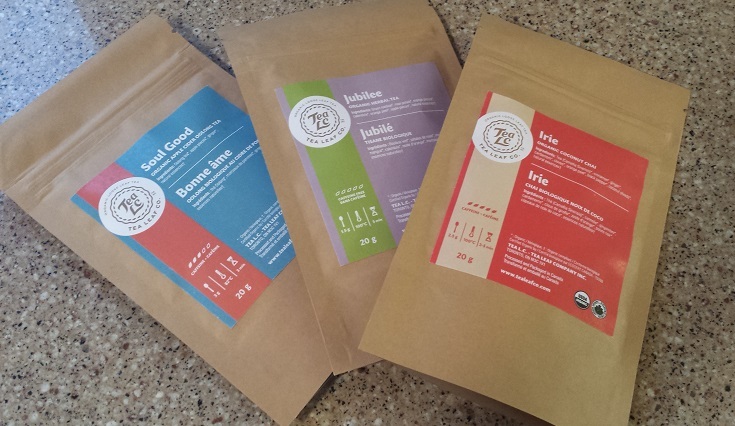 I’m quite happy with my choices, though; Tea Leaf Co. has more blends to try, and many of them look very promising. One final thing I’d like to note about Tea Leaf Co is how solid their branding is. Their site is bright and easy to navigate, their colour scheme and typography are clear and distinct, and the quality of their packaging is apparent when looked at up-close. On top of that, their customer service is top-notch: the owner, Stephanie, mailed my package almost immediately after it was ordered even though she was very busy dealing with many things at once, and the tea was delivered wrapped in a beautiful layer of colourful tissue paper. The package also contained a handwritten thank-you note that included a custom coupon code for future orders.